If you've followed our blog from the beginning then you'll know how much of a fan I am of the Howard B. Wigglebottom series. Not only have I've posted reviews for some of the books, but I've become such a huge fan of what this series stands for. In each book of this series there is a lesson for your child to learn. 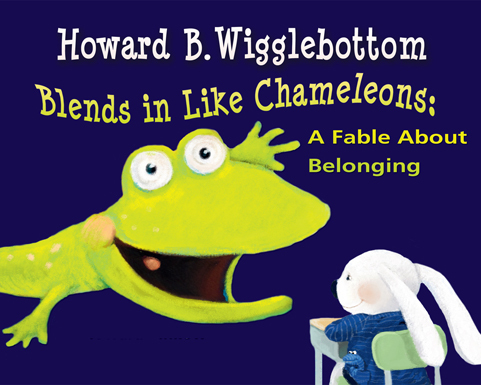 We were fortunate to get the chance of reviewing Howard B. Wigglebottom Blends in Like Chameleon, which helps kids to understand that it's okay to be different and unique, but you also have to learn to be respectful of not only yourself, but others. In this story Howard is introduced to a new student, Joey, who is very disruptive, doesn't like sharing and considered a bad kid to the other students. Howard feels bad for Joey and befriends him and helps him learn along the way that being different is okay, but to try at least try to fit in with the other students so that you're not typed as an outcast. While reading this to my kids we talked about how at some point every kid was new to a school. Whether they went in knowing other kids or not, when you enter junior kindergarten every kid was new and that every kid was different, but we have to learn to share, be respectful and have manners. My daughter felt bad for Joey and didn't understand why he was acting the way he was until at the end of the story. What I love about this series of books is that not only does it teaches your child a lesson as they're reading the story, but they also have online animated games and stories so that your child can see Howard in action and it's perfect for those little ones who can't read yet. To check out more about Howard B. Wigglebottom and the other books in his series, please visit their site HERE. Also, all of the books in the Howard B. Wigglebottom series are on sale for $6 each and they're normally $15, that's a huge deal, especially since Christmas is around the corner! Disclosure: All opinions are my own. I received the above mentioned book at no cost for the purpose of this review. No other compensation was received. A big thanks to the company for the giveaway prize.